Ed Trust is proud to offer school leaders and educators our new Assignment Analysis Guide. 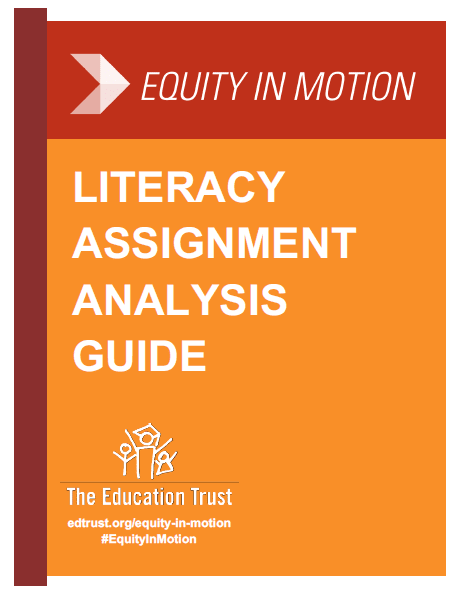 The guide is the newest resource in Ed Trust’s Equity In Motion — our series that examines middle school classroom assignments to determine how well our nation’s schools are implementing college- and career-ready standards. After we released our first “Checking In” report and the subsequent “Checking In Update: More Assignments From Real Classrooms,” along with our interactive tool, practitioners wanted more information to gauge the quality of their literacy assignments. With this Assignment Analysis Guide, we are delivering on that request by providing a user-friendly tool to help school leaders and educators analyze their own assignments and to provide considerations when creating new assignments for their students to complete. As you work with your instructional teams, Ed Trust invites you to take this guide and make it your own. You may decide to use it as is, or you may choose to tweak language or refine the focus to make it appropriate for the particular context in which you work. Either way, we hope you find it useful. And we’d love to hear how you’re using it and the degree to which you find it helpful in starting conversations and driving improvements in the work we ask of our students. We encourage you to use this guide as a resource when analyzing sets of assignments across multiple days or weeks within your classroom, school, or district. It can also be used to call out important features to consider during the assignment formation process. receiving light or heavy supports from teachers as they work toward independence, engaging in tasks that hold relevance and support adolescent autonomy.